Lucas Torreira was all smiles as he flew-out of Uruguay en route to London to start his new life at Arsenal following his £26m move from Sampdoria. The 22-year-old was strongly linked with a switch to the Emirates in the months leading up to the World Cup and a deal was agreed in principal shortly before he flew out to Russia but the midfielder decided to delay undergoing his medical until after the tournament. 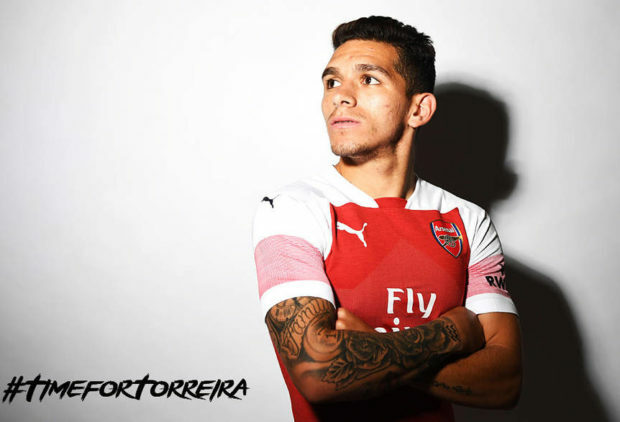 Once Uruguay were knocked out Torreira was free to complete his move to Arsenal and his signing was officially announced on July 10th but he was given three weeks off following his exploits at the World Cup. The midfielder has been relaxing in South America but he posted a photo on Instagram on Saturday night of him posing with his passport at the airport as he prepared to fly to England from Montevideo. Torreira arrived on British soil earlier today but he won’t have long to acclimatise and get over his jetlag as he’s due to report to pre-season training with Arsenal on Monday morning. The rest of the squad are also due back at London Colney after arriving in the capital this evening after ending our pre-season tour of Singapore with a 5-1 win over Paris Saint-Germain on Saturday. Torreira won’t have long to get to know his new team mates as he’s expected to travel to Dublin with the rest of the squad for our friendly against Chelsea on Wednesday night. It remains to be seen whether the midfielder will play any significant part in that game but we should see him in an Arsenal shirt against Lazio next weekend.